June 30, 2018 /0 Comments/in For Educators, For Individuals /by Anja A. You turn on the TV in the morning and the first thing you hear about is another shooting. Unfortunately, this isn’t such a rare occurrence lately. If you’re a parent, the first thought that comes to mind is probably “How will I explain this to my child” and this thought is even more concerning when you realize that you have to tell them about something we as adults can’t fully grasp ourselves. When faced with this question, many parents’ first instinct is to shield their children. Turn that TV off, hide the newspapers, even go out somewhere where the chance of hearing bad news is close to zero. This is especially true if you have a young child who still doesn’t have their own way of hearing about what’s going on in the world on a daily basis. But our first instincts are not always right and, in fact, we may be doing more harm than good by shielding our children. The truth is, in today’s world it’s almost impossible to hide something from your child, no matter how young they are. Sooner or later, they ’ll hear about whatever tragic event you are trying to hide from them, and they won’t know how to make sense of it. Hearing about these events accidentally from strangers will most likely make them feel less safe than if you’d explained what happened and talked with them about it. It’s also crucial to talk with children about these events because they often occur due to discrimination or hatred towards a particular group of people. In choosing not to tell our children about this, we raise them to be insensitive to many of the problems people face and they’re more likely to dismiss the complaints of minority and discriminated groups, simply because they were never exposed to these challenges themselves. We, instead, are raising them under a generic umbrella statement parents often use “We are all equal”. Parents usually mean this and want to teach their children about the importance of equality and inclusion. But the consequences of not facing reality can mean that when your child learns about Charlottesville or events similar to this, they react with “But we are all equal” confusion. By talking about events such as Charlottesville or the more recent Florida school shooting, and the motives behind them, we’re teaching our children to be more sensitive to complicated issues, and more conscious about the world they live in. Honest and thought-out conversations are more likely to make our children able to understand morally complex issues than blanket statements that can lose all meaning as soon as something unexpected happens. Raising more conscious children, together with making them feel as safe as possible when these events occur, is why we should try to fight the urge to turn off the TV and engage in an honest talk with our child instead. Of course, how we approach these topics depends on the children’s age, too. It’s extremely important to discuss such events in an age-appropriate way. Even though we said you should resist the urge to turn off the TV, if you’re the parent of a younger child, turning off all media outlets isn’t such a bad idea – but this doesn’t mean you should pretend that nothing tragic ever happens. Constant exposure to news might be too much to handle for your young child and might be too confusing, especially if they hear reports from different sources or if investigations are ongoing. Instead of having the news running, sit down with your child and tell them what happened. There’s no need to be too graphic, but try not to beat around the bush when it comes to the more difficult parts of the story. There might be a need to explain the concept of death in these situations. Explain it. If you weren’t with your child when they first heard the news, ask them what they heard and what that means to them, and listen to everything they have to say without interrupting them. This will help you realize how your child is processing the event and give you guidelines on what to talk about with them. Don’t hesitate to try to explain the motives behind some of these crimes in a language they’ll understand, especially if they ask why somebody committed them. But, since these events are usually hard to grasp even for adults, don’t feel like you need to give an answer to every question. If you don’t know something, it’s okay to say that you don’t know it. Even if your child is young, they might surprise you by how much they actually understand about the world. Parents usually don’t want their children to see them as vulnerable, but it’s important to show children that these events are upsetting to adults as well. By sharing our feelings, we also validate their own feelings and give them a chance to see that we can carry on even if we feel upset and these events make us worry. Talk with your child about how they feel and make sure that they know you understand and acknowledge their feelings. When these tragic events happen, as well as considering how to shield our children from the news, we also think about how to reassure them if they do hear about them. Reassuring is actually an important part of talking about these things. Make sure that your child knows that you will do everything in your power to keep them safe, that they know you are there for them and that they are loved. In the end, it always boils down to this. All the tips above apply equally to talking with your teen, but there are also some specific things you can cover when talking with adolescents about tragic events, especially those involving their peers, such as the school shootings. Instead of pushing your teen to talk about a certain event right then and there, give them some time to process it and let them come to you when they’re ready to talk about it. If they never want to talk about it, that’s fine, too. They might have their own ways of coping with it or the event didn’t affect them as much as you thought it did. Make sure they know you’re available to discuss the event and all that it entails with them, and that you won’t judge them no matter how they feel or think about it. Also, don’t treat them like children. Of course, you should be mindful of their age, but don’t try to shield them from everything and don’t shy away from complicated topics. They probably already read a lot about it in the media, and it’s much better they talk it over with you than to read comments on the Internet. If you see that they want to learn more about a certain issue or event, try to find some books they could read that cover a similar issue. You can even read them together and discuss them. If you notice that your teen wants to do something about what happened, be sure to let them know that there are things they can do and that they shouldn’t feel like they can’t help or that the situation is beyond help and hopeless. You can encourage them to go online and find causes they can volunteer for, or think about what they like doing and try to figure out how that can be used to help the cause. For instance, if your teen likes writing and wants to stop gun violence, you can encourage them to learn more about it and write a blog, or get their friends to work on the blog together. If they enjoy drawing and/or graphic design, they could help various organizations create slogans and leaflets. And if they’re more interested in the tech side of things, they could even work on an app that would show where organizations that help prevent gun violence are located or who to contact if you need help. The options are endless! 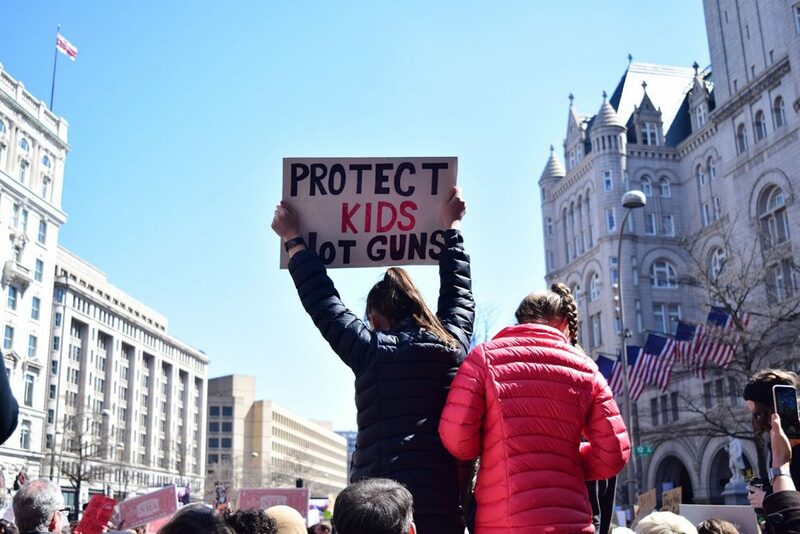 In March, 17 people were killed in a Florida high school and many students wanted to do something about it, so a National School Walkout was organized and students went to the streets to protest gun violence. If your child wants to participate in a peaceful protest like this one and you think they’re mature enough to do it, don’t be afraid to let them fight for their rights. They can only become responsible citizens if they are aware of the world around them and aware of the fact that they count and can help make changes. Last but not least, and this applies to children of all ages, be sure to keep track of how they are behaving. If you see that they are more agitated than they used to be or can’t sleep well, talk to them about it. If they are quiet and withdrawn, try to find out how they feel and if there is something they’d like to share. It is normal that their behavior is unusual when something tragic happens, but it is of extreme importance to make sure that they don’t feel alone or scared and that they feel protected. And if you think your child took it pretty hard and you don’t know how to handle it, don’t hesitate to contact a professional who will know how best to guide your child to overcome their challenge. If you need any kind of advice related to the troubling events, you’ve come to the right place! The Self-Fulfilling Prophecy: You Create Your Future How Can Pets Benefit Children’s Development?